We’d love your help. Let us know what’s wrong with this preview of Lost Race of Mars by Robert Silverberg. To ask other readers questions about Lost Race of Mars, please sign up. Read this as a kid (many times), and loved it. Recently unearthed it when emptying my parents house to go on the market. Perfect timing, for my two daughters (8 & 11) to read! A bit outdated now - it's set in the year 2017, in a colony on Mars, but still delightful. A wonderful start to a life-long love of reading science fiction. A few days ago I was looking somewhat frantically through the books on the shelves in my closet (yes, I have a floor-to-ceiling bookshelf in my closet) for something to read to my son, Sebastian. Lost Race of Mars almost fell into my lap. I'd read it several times as a child myself, and remembered liking it quite a lot. I'd nearly forgotten about it, but I grabbed it and read it to him. It was written by Robert Silverberg in 1960, and includes some charmingly albeit slightly crude illustrations. A few days ago I was looking somewhat frantically through the books on the shelves in my closet (yes, I have a floor-to-ceiling bookshelf in my closet) for something to read to my son, Sebastian. Lost Race of Mars almost fell into my lap. I'd read it several times as a child myself, and remembered liking it quite a lot. I'd nearly forgotten about it, but I grabbed it and read it to him. It was written by Robert Silverberg in 1960, and includes some charmingly albeit slightly crude illustrations. Sebastian loved the book, and chuckled over every drawing. It's the story of a family who visits Mars for a year on that far-off date of 1991. The children, Jim and Sally, are the primary focus. But what grabbed Sebastian the most were the cats. First was the family cat, Chipper, who is left behind on Earth early on. Sebastian asked several times if we'd see Chipper again. A few illustrations later in the book showed Chipper, and he was particularly interested in those. He is a cat person (we're a cat family, in fact), so his interest was quite natural. Perhaps someone who doesn't like cats wouldn't enjoy the book as much as we did. There was also Mitten, the Mars cat, in the later chapters. Again, Sebastian loved Mitten and chortled over the drawings of him. The story is nicely paced, well-written, easy to read aloud, and has a very satisfying ending. The science is a little shaky, but not outrageously so (I'm still tempted to look up the temperatures on Mars). The prognostications are way off - a thriving Mars colony by 1991?!? - but that's not an insurmountable problem. The Martians themselves are, well, pedestrian by modern science fiction standards. But they work well for children, and that's who the book is written for. I'll also credit Silverberg with giving Sally, the younger girl in the book, a stronger-than-customary role for the time; she's not simply a stereotypical docile little sister, nor is she one of those cliched "spunky" girls. Sebastian is nine and a half. He's a bit advanced when it comes to books, but I'd say we hit the sweet spot with this one - he's the perfect age to enjoy it. I think any child from say, eight to thirteen would be likely to enjoy the book, and many older children would too. The book is extremely dated, but I enjoyed it when I first read it in elementary school as a wonderful introduction to the sci-fi genre. I love this book. It was one of the first sci-fi books I ever read. Looking back, I now understand why i love anything about Mars and aliens. I read this as a kid and loved it, but don't remember much about the story. I recently unearthed it and would like to read it again. Please let me love this book! Robert Silverberg is one of those authors I can't help but admire. He supported himself by writing - pulp mostly in the early days. This book is a perfect example of that. Set in the startling future of 2017, we follow two children and their parents to the Mars Colony (which is a somewhat common trip at this point) where they set out to see if they can discover life on the red planet. They're not disappointed. I absolutely adored the descriptions. The idea of what lif Please let me love this book! I absolutely adored the descriptions. The idea of what life would be like that many years in the future - this book was written ...what...50 years ago? was priceless. Some things are eerily true. Others you look at and can't figure out how it was no one guessed that those things might go away. Then of course, there are the space cats. Because, obviously you need space cats. This short novel stirred my imagination so much when I was a boy. A fun little futuristic tale of Martians accidentally discovered by two children while visiting Mars with their parents. An entertaining enough read. Definitely your standard outsider kids work to fit in and do so while also saving their dad's reputation. It is definitely a product of its time - don't expect housewife mom to have any role to play other than to gratefully follow dad and support his career - she basically disappears for most of the book. In fact, don't look for any female role models, though it is a brother-sister team at the heart of the story. This was the very first book, of any length, that I read from cover to cover. Enough science to qualify as science fiction and enough gentle kid adventures to be a good kid's book. 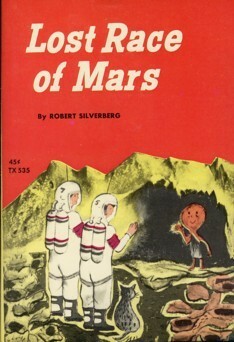 Silverberg was rather optimistic about the future of manned explorations to Mars in 1960.